Odd-Rocs 2008! The mind of an odd-roc'er is not something to look into casually, so we will attempt to look at their productions to avoid direct contact and possible contamination. So let's see them and let's see them fly! 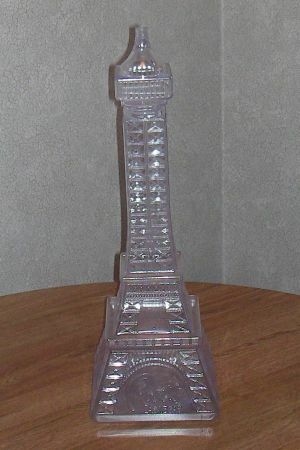 Winners will be judged by EMRR Guests during a voting week of July 14 - 20, 2008. (1) Static - on display, on pad, etc. (1) Dynamic - lifting off, flying, returning, etc. Contest is over on 7/13/2008. Online Voting will take place from 7/14 - 7/20. ARA Press (1) copy of the Spaceship Handbook by Jack Hagerty and Jon C. Rogers, published by ARA Press. Over 100 Data Sheets on 75 different spacecraft. Flis kits - Just Past due. PRIZE SELECTION: The normal prize selection procedure for EMRR is that at the end of the contest winners will get an e-mail asking them to select from the remaining prizes in the order that they placed. My INSPIRATION? Hunger! I am always looking for something new to fly. A Hot Dog? Why not! I tried to make this as realistic as possible. When I walked over to launch, one youngster asked if I had any extra hot dogs. It was lunch time and he was hungry! The toughest part was the bun. Two Semroc BC-2025 (20 size) nose cones were rounded off and split. One side of the ST20 body tube was split lengthwise, then creased on the back for the open bun. On the nose cone tip, I added wrinkles like on a real hot dog. 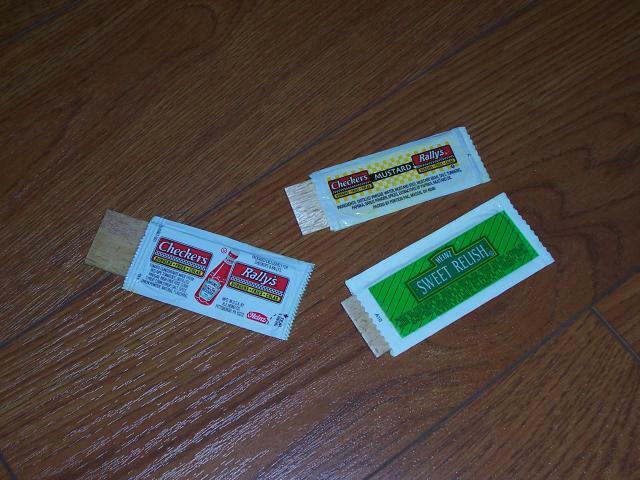 My nine-year-old daughter suggested using the condiment packages in the design. They worked very well for fins, contact cemented over 1/16" balsa. RECOVERY WAS A 12" PARACHUTE in yellow and red in keeping with the mustard and ketchup condiment theme. Ive been away from home for a while. This was a rush job, just in time for the contest deadline, built in four days. If there were more time I would have added grill marks and some mustard, ketchup and relish to the dog. I flew it on July 10, 2008. 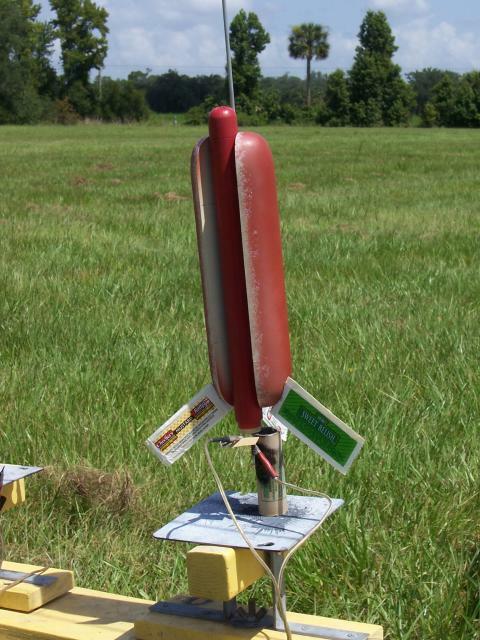 The (S)HOT DOG FLIES ON A C6-3. 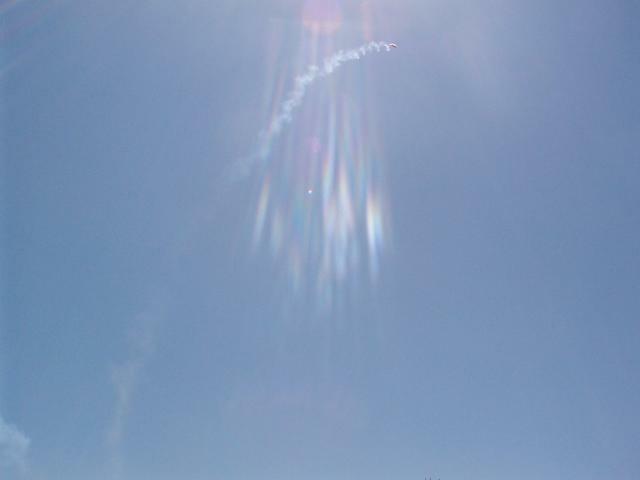 The first flight was vertical, but spiraled up. The CG was fighting the CP a bit. Deployment was on time, no damage. The second flight was straight up. Bob (Orlando R.O.C.K. member) offered a quick link for additional nose weight. Tom (another R.O.C.K. member) volunteered modeling clay. 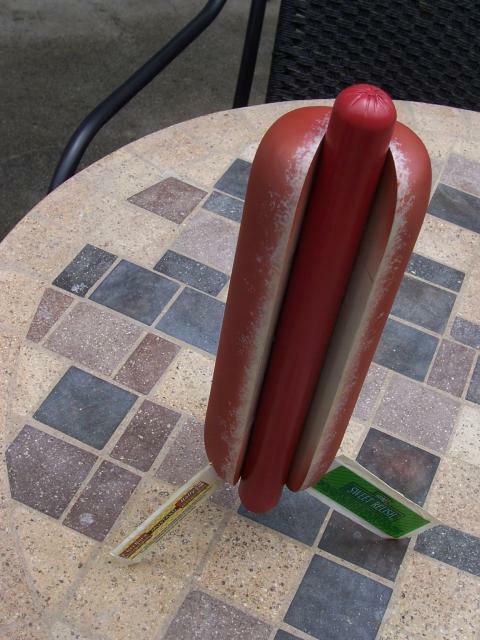 I pressed two small lines of clay down into the hot dog near the nose. The C6-3 was perfect for the Dog. Slow lift off and vertical fight. I would estimate the ALTITUDE AT 225 FEET. 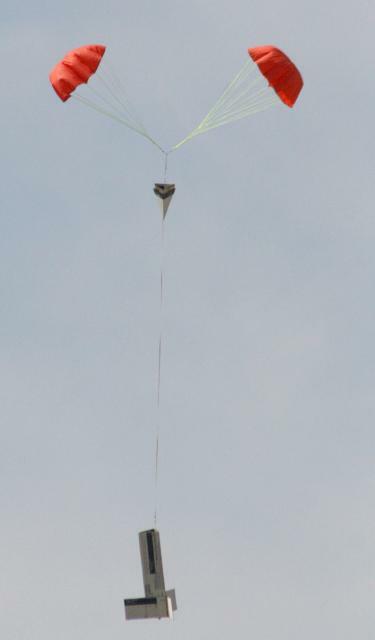 The parachute deployed right after apogee. There was no damage on recovery. Overall the experience was a SUCCESS. I had forgotten how much fun a scratch-build could be. Fabrication of non-standard parts was a little tough, but worthwhile. 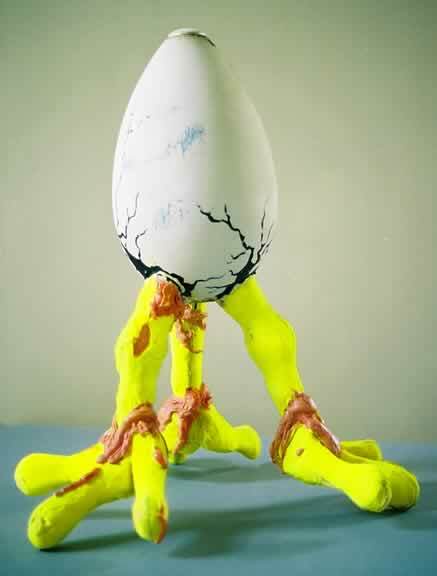 A large plastic Easter egg with nuclear waste-colored legs bustin' out. 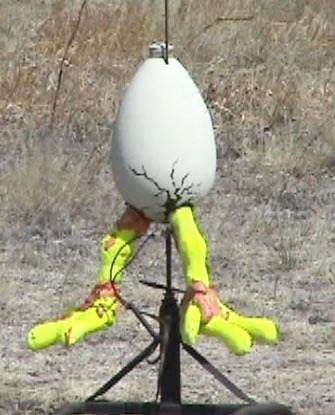 Since it's from Los Alamos, it's a mutant with three legs. The Senior Prank was a brainstorm while I was in my favorite room of the house trying to come up with a cleaver submission to the Odd-Rocket Contest. I began focusing on the toilet paper sitting next to me on the wall for a couple of reason, but I won't go into that. 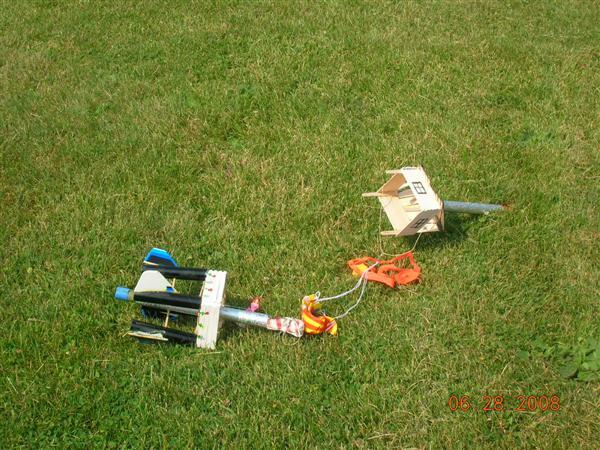 I realized that although I had seen a number of rockets made from the toilet paper tube, I had never seen one with the toilet paper still on the tube so I decided I would build a rocket that could launch 3 rolls, eject them and TP the launch area. 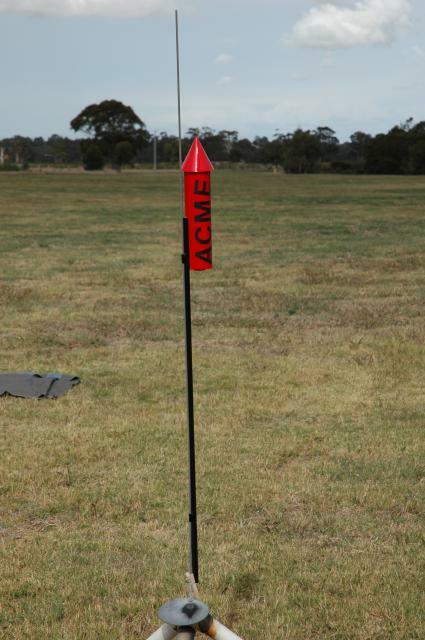 ACME "Wile E. Coyote" styled rocket. Single Stage, parachute recovery. Very happy with the rocket. Turned out exactly how I wanted. Nice big and bright. Got all the appropriate kudos on the flight field. The Walmart kid's shampoo aisle is a great source of nosecones.. The screw cap on the bottles is almost a perfect fit for BT-50 tubing. Very little modification is usually necessary to turn a shampoo bottle top into a "character" nosecone (see here ). 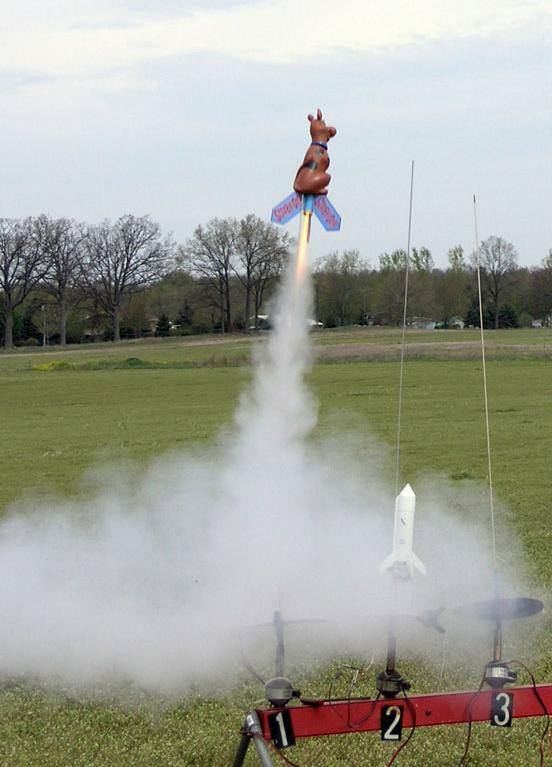 Having built a number of kid's character rockets, I decided to build a Scooby-Roc as well. But when I started Scooby I just couldn't ignore the bottle's sort-of aerodynamic shape. After a fair amount of pondering, I decided to include Scooby's body as well. After "applying, rinsing, and repeating" enough to empty the bottle, I dremeled a BT-50 sized hole in the base, and cut off the bottletop shoulder. I sized a piece of BT-50 long enough to support fins, extend up through the body, and into the bottletop. Since this one would be a little difficult to Rocksim, I erred on the side of over-stability and used big trailing balsa fins and a fair amount of noseweight. Similar to the actual character, Scooby's head is partially filled with BBs and epoxy. To make the nosecone shoulder, I drilled some holes in an old BT-50 sized plastic nosecone and stuck it into Scooby's head as the epoxy dried. To keep it properly centered I used a short piece of BT-50 on the cone. Final detailing involved covering the fins with label-paper graphics. I covered the graphics with Rustoleum Clear and, when dry, epoxied the whole fin unit into the shampoo bottle body. The launch lug is just two 1/8" holes drilled in the base and back of Scooby's head (ouch). Power souce is a D12-3 and Scooby flies amazingly well. Just like the real Scooby, always straight and true. Gives a whole new meaning to the phrase "Scooby Doo, Where ARE You?" As odd rocs go, monocopters have been around for a while but they've never really "taken off" (pun intended). I'm hoping to change that by making a high performance 13mm monocopter out to of common household items. Six popsicle sticks, two index cards, 18 inches of twine and white glue are all that is needed to build this one. 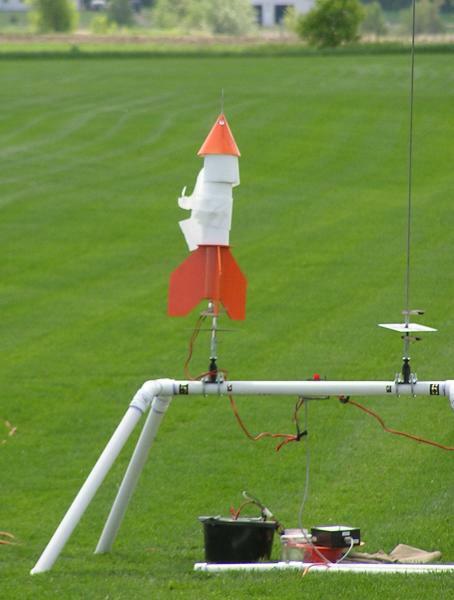 It flies best on Estes A3-4Ts but it can also be flown on Estes 1/2A3-2T, A10-0T, A10-3T and A10-PT motors. 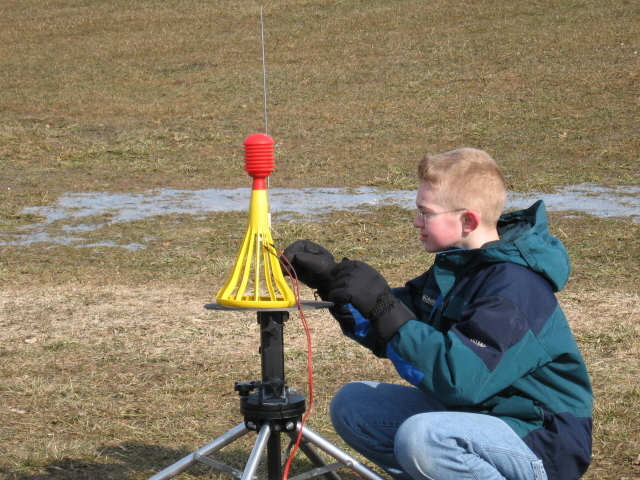 It uses a very short, 1 inch long, 1/8 inch diameter launch rod and can be flown off a standard Estes Port-A-Pad using their Electron Beam Controller. 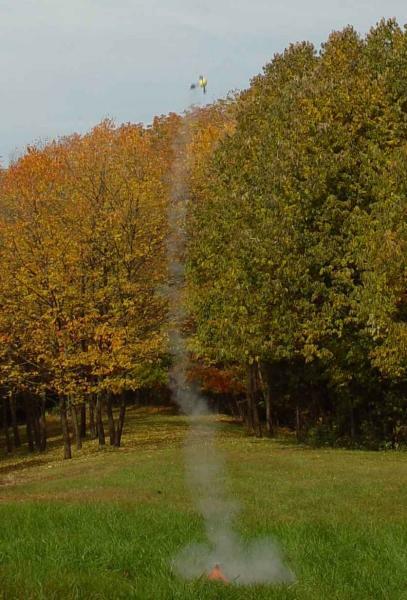 It is well behaved even in windy conditions and the spiral smoke trail it leaves is dramatic. During descent it autorotates for a soft landing near the pad. 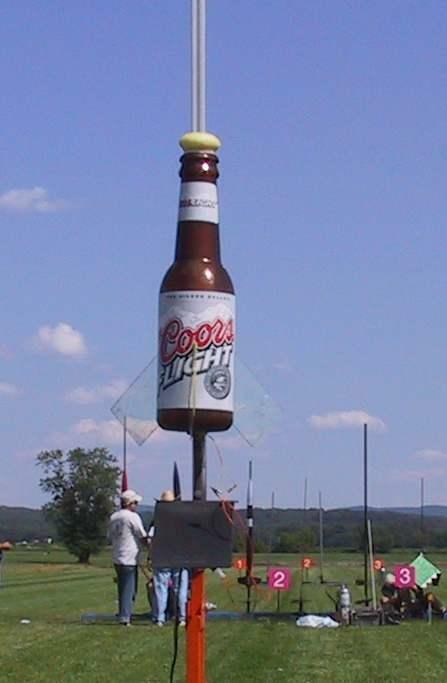 It can be flown safely in most back yards and won't get stuck in trees. I got a lot of bang for my buck with this one. Half of the parts were free and the rest cost just pennies. I've posted an EMRR review for this rocket with the main details. Complete instructions with lots of pictures are available here. Here is my entry for the 2008 odd-roc contest. It's called the Dunk R' Licker. It's part lollipop, noise maker, and get the ball in the bucket game. My brothers challenged me to make it fly and I said I would. We weren't expecting much, but were surprised when the A10-3 shot it straight up to around 200ft. We're now thinking of a possible upscale. One day while I was pondering my cabinet full of possible rocket parts, which I had been collecting for some time, an idea came to me. 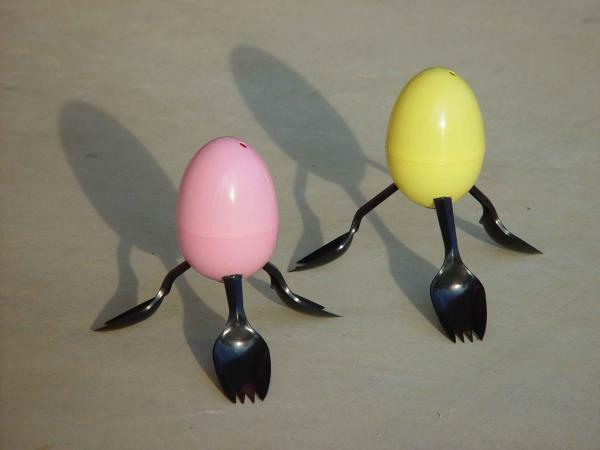 What if I used a plastic Easter egg, and added sporks (spoon/fork combo) as hi-drag fins? 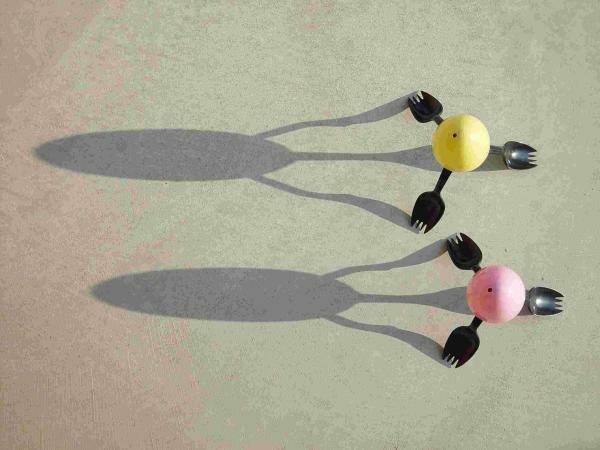 That was the question that lead me to create the EO3S (Egg On 3 Sporks). 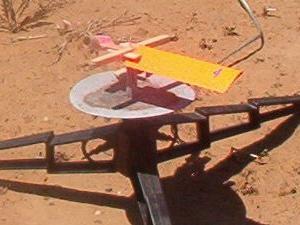 I later improved on the design by canting the sporks slightly to cause the rocket to spin. 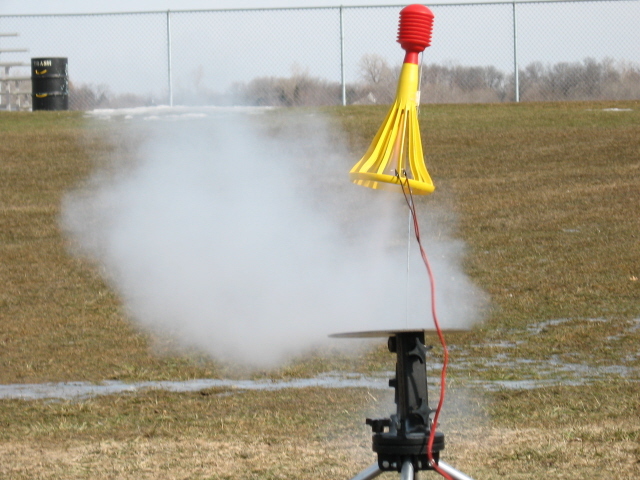 Only an Estes A10-PT motor should be used with this rocket. It spins like mad going up. It falls backwards a little while still spinning because of the strong gyroscopic forces. Then it tumbles, and about halfway back down, it starts to spin again. It returns with helicopter/hi-drag recovery. It only goes maybe 50 feet high, so you can easily see all of this. It's a big crowd pleaser. 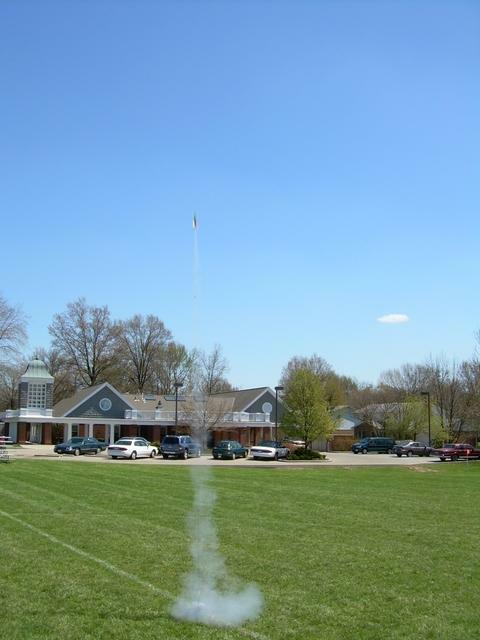 The last time I launched it was with the St. Louis Rocketry Association at Buder Park on 17 May 2008. At this launch it did something special. After descent, it hit the grass nose first as usual, but it bounced once and landed on all three sporks (nose pointing up)! 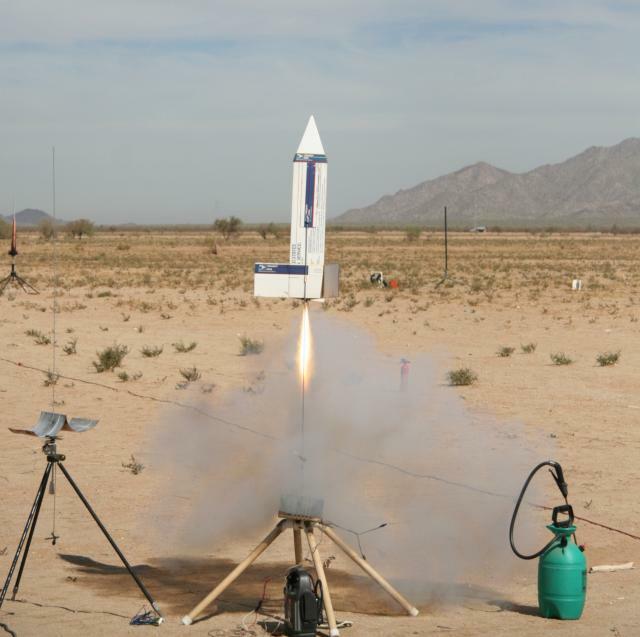 You can see the entire article as it appeared in Sport Rocketry magazine at http://www.stlouisrocketry.org/EO3S_PDF.PDF . An odd-rocketeer has a twisted world view. I'm not quite sure whether having the twisted view makes you an odd-rocketeer, or whether being an odd-rocketeer gives you the twisted view. Either way, it doesn't much matter. The odd-rocketeer can't help but wander through life looking at objects and saying "I can fly that." That's how I came to be in possession of an oversized beer bottle bank full of popcorn. When I saw it, I knew I had to fly it. The popcorn was awful. The airframe is great. It's been flown in two configurations; with cap, and foaming at the mouth. Both are immensely satisfying. Immediately when I saw this contest, I started to think about entering, and what my entry could be. 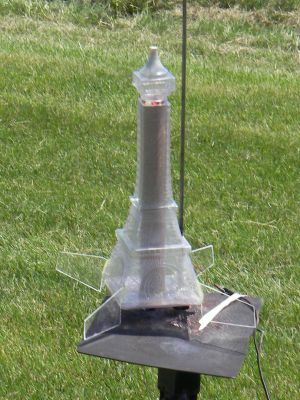 As with any "odd-rocket" (or odd rocketeer, often both), any light weight, hollow plastic, or rocket-shaped item in the house got a second look. 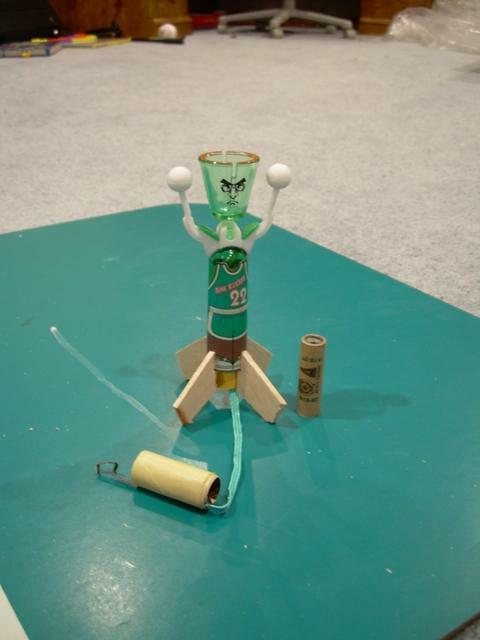 Among the eccentric items that got this was a "pop-a-lot" ping-pong ball shooter. 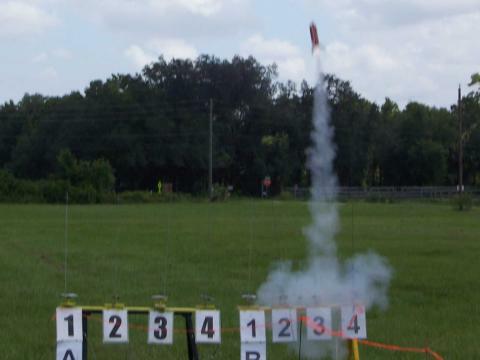 This fell into the category of "rocket shaped". With the addition of a rear-eject motor mount, it was time for a simple stability test (strangely often recommended with odd-rocs). 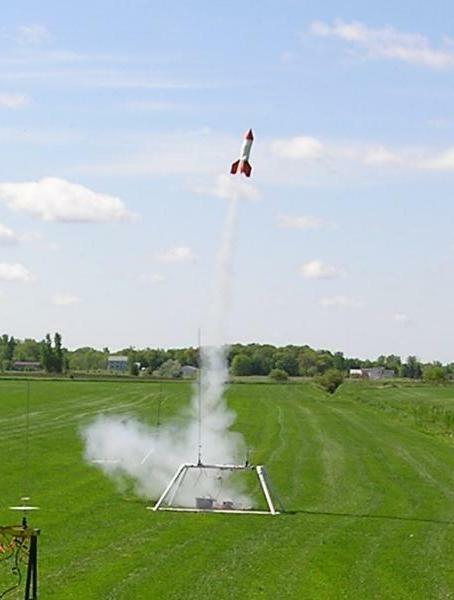 During swing tests, the rocket seemed to want to point forwards, however (I think you could see this coming, and not just if you were reading ahead), it seemed to have somewhat marginal stability, but I thought it would be O.K.. So, on March 29, I went with my dad to the first MASA launch of the year to fly it. 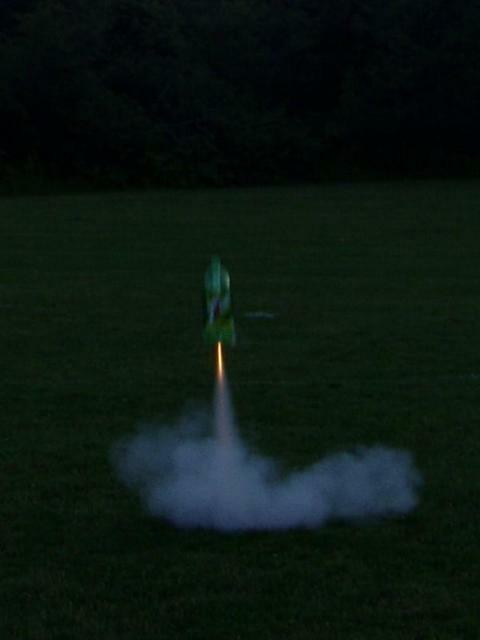 I First tested today's luck with the other two rockets I had brought, the first of which CATO'ed loudly, and the second ejected too late for the 'chute to deploy, causing some minor damage, so I decided to go ahead with this one. Because it was cold and windy, which does not facilitate the dexterous use of your fingers, I attached the igniter wires in between the fins (see picture). My dad, to his credit, noticed the danger in this, but I, to my credit (for what happened), ignored him (my thirteenth birthday was in two days, so I was getting a head start). The rocket, ... (see the second picture and the video). Nobody was hurt, which is lucky, as I was about three feet from my dad, and it went in between us, sort of like in 'October Sky'. Some modifications may be necessary. 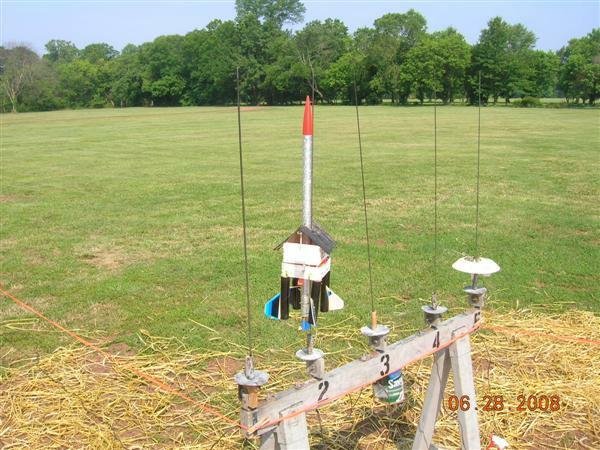 Ok, Odd Rocket for contest. An odd rocket: Maybe not, still looks like a rocket! Odd choice of material: Yes! USPS postal mailing box. All cardboard construction. Odd choice of motor: Yes! Dang thing weighed much more than anticipated, had to go with 29mm motor mount. Odd paint scheme: NO, just a plain old USPS postal mailing box. DUH!!!!! Odd flight profile: NOPE! Dang thing flies incredibly great on F 25-4 SU AT motors. At this time, has nine flights on it. Has not flown on anything else. Why tempt perfection!! Odd name for rocket: Maybe! 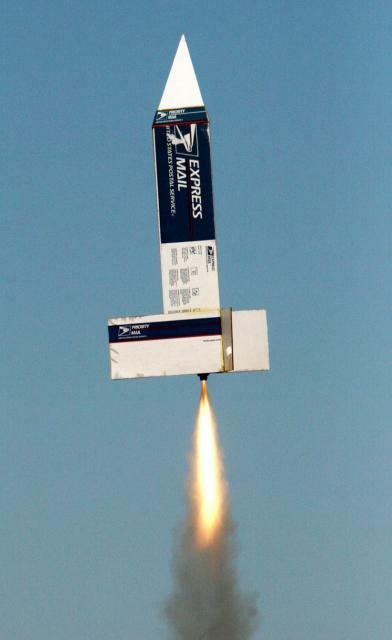 It is called Going Postal. Odd looks from almost everyone at a launch: OH,YEAH! Most people chuckle at the sight of it and the rest are convinced it will shred REAL QUICK!! 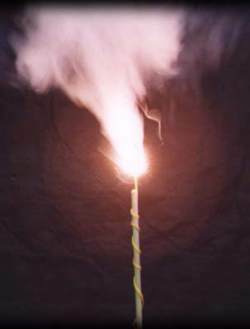 You should see the reaction of the RSO's who don't know about it and the others when it goes straight up just fine!!! ODDROC: Could be! You're the judges!! I got the idea from the reality show "Master Blasters." 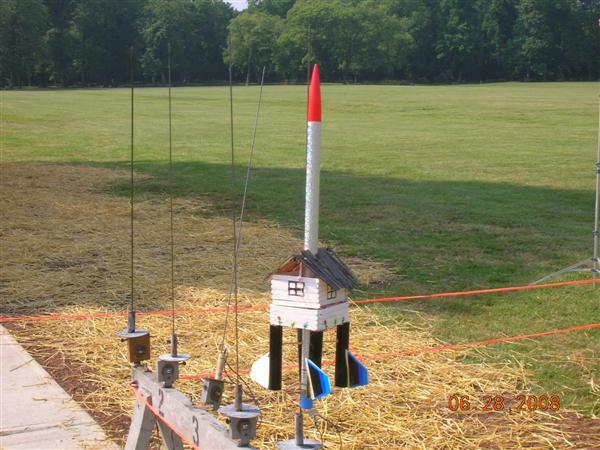 Took parts from several rockets and using spent D motor casings, built a house to hold "Dorthy and wicked witch of the west, from popsicle sticks. The trick was to build it in two pieces so it would separate. Hence the "spent engine cases," held guides from the roof section. At apogee, it was suppose to separate, eject wicked witch, and parachute house and Dorthy down safely. As u see in last picture, after an "end over end flight," roof stuck in ground. Will try again with longer body tube. When I first saw the 'odd-roc' competition, I immediately started scouring the house for something to send up into the sky! Most of my ideas were ending up on the rocket-building room floor, and just as I was starting to think about throwing in the towel on this contest, it came to me. While relaxing one hot summer night and enjoying a tall glass of 7up, it suddenly hit me. I quickly finished off the rest of the pop and got right to work! For my first step, I cut out four clear plastic fins and with a little bit of epoxy they would fit just right to the side of my 2 liter pop bottle. Second, I hole sawed a perfect size hole in the bottom and ran a 24mm stiffer tube up the center which would house my shock cord, parachute, and engine. I then cleaned the threads out of the cap, attached the shock cord to the inside, and added a bit of weight for stability and I was all set. For flight time, I installed a C6-3 and let it rip. I would estimate it got up about 100 feet in the air and took a nasty spin. Next time a bit more weight in the nose and little higher thrust motor would do just fine. After all was said and done, I removed all of my modifications returned the bottle to my local grocery store and got my 5 cent refund. 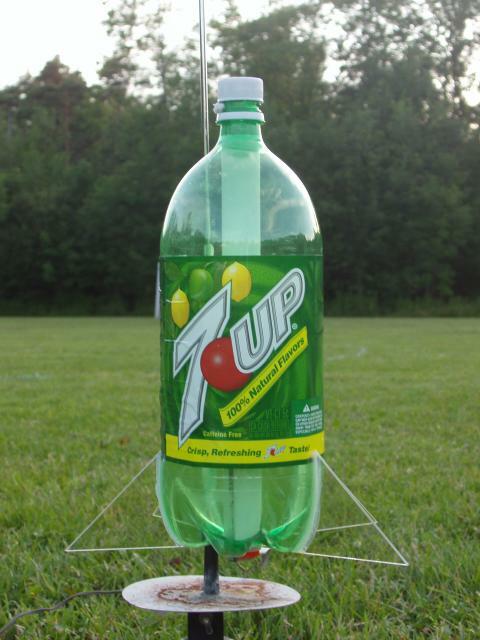 Who says rockets can't be recycled?!? This is your non-run-of-the-mill plastic model conversion. My motivation for this rocket came from draining almost a quart of Pina Colada from the Eiffel Tower-shaped daiquiri glass. 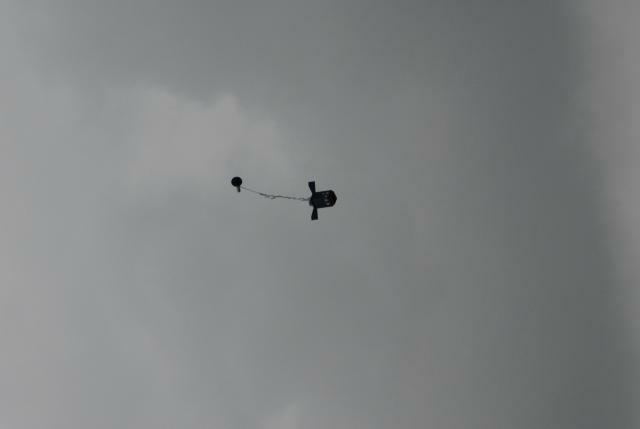 The build was really straightforward and the first leg of the flight was great, with the rocket flying straight even in heavy winds. The down side wasn't so great - a long delay re-kitted the model. I chalk this up to operator error, not a bad design. Dr Who fans will immediately recognise the Police phone box that is the TARDIS. TARDIS stands for Time And Relative Dimensions In Space. It is the method of transport through time and space for the Doctor: the last of the Time Lords. It is shaped like a police box due to an accident on earth where the TARDIS was damaged and got stuck in its present form, until the accident, it would camouflage itself into what shape suited its environment. Using Time Lord Technology, the TARDIS is famed for being bigger on the inside than on the outside. 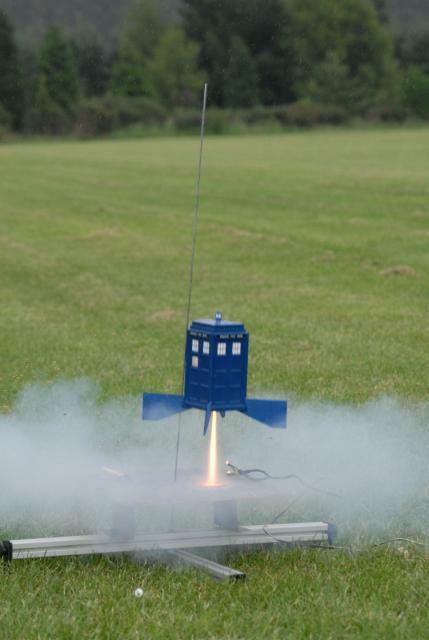 This rocket started life as a money box filled with sweets. It is actually the second of my TARDISs: The recovery system is rear ejection. 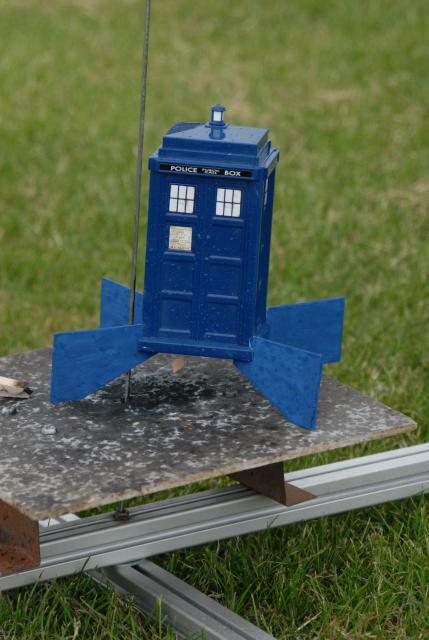 A 24mm couple was weighted with a washer and Steel bonded to the top of the TARDIS â to raise the CG. On ejection the whole tube and base will eject, the base is linked to the outer TARDIS via a shock cord with a parachute attached. The recovery system is an 18 inch chute, this needs to be wrapped next to the body tube and be held against the to be via the shock cord. Flights are on D12-3. and gets to a respectable hieght of about 400-500 foot. The whole thing cost me about Â£3 to make ($6). 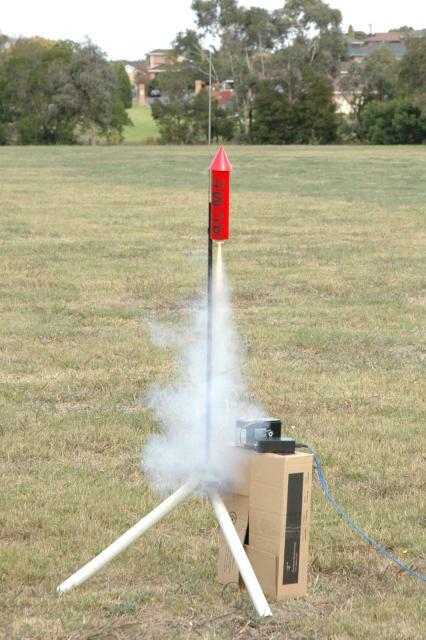 There are similar rockets on the market, but I like mine, and its a lot cheaper too. The static photo shows a TARDIS in the rain... it always rains. 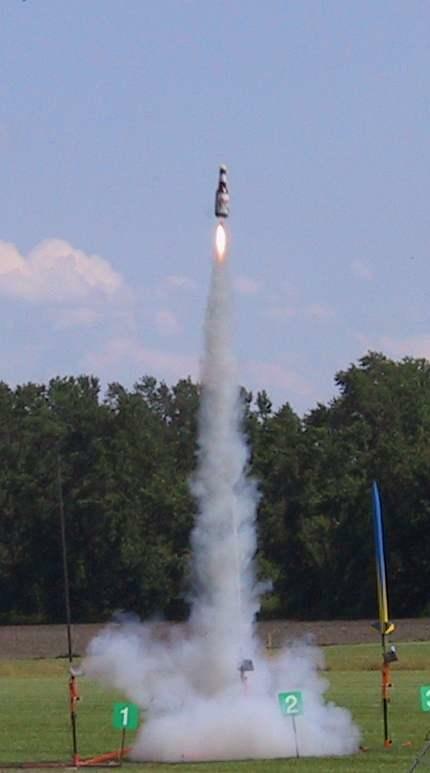 The second shows lift off on a D12, and the third shows ejection of the core just before the parachute was deployed.